The recent controversy surrounding the Crossfire exhibition at Drik Gallery in Dhanmondi has finally ended, with the closure of the exhibition last week. Crossfire was intended to raise awareness about the lack of accountability of the Rapid Action Battalion, the anti-crime and anti-terror unit of the police force established in 2004. 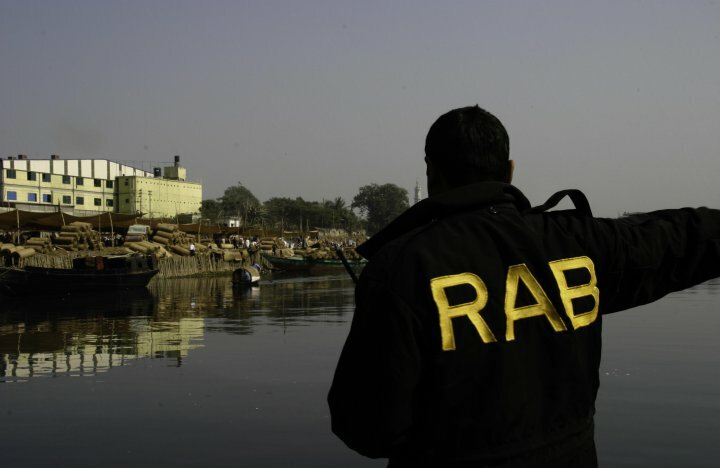 The forcible week-long closure of Crossfire by police acting on government orders further ignited a general resentment towards RAB’s operations and the public’s right to debate it. I met with Crossfire photographer and Drik’s Managing Director Shahidul Alam as well as high-ranking RAB officials to discuss the concept of “crossfire” and extrajudicial killings. Unsurprisingly, their views on the subject differ dramatically. However, those who die in RAB custody are almost always officially recorded as having been killed in crossfire or a shoot-out. So widespread is the level of suspicion surrounding such repetitious circumstances that national newspapers report the deaths through “crossfire” or a “shoot-out” in inverted commas. Amnesty International regards these terms as a euphemism for extrajudicial executions. I asked Commander Sohail whether it bothers him that inverted commas are used. He said, “People can write whatever they feel – there is full freedom. Why should it bother me?” But when I pressed him further by emphasising that the inverted commas indicates disbelief, Commander Sohail sighed deeply and changed the subject. Shahidul is grateful for the coverage his exhibition received in the media, even prior to the police action. As well as being covered by the major news organisations in Bangladesh, The New York Times carried the story on its front page prior to the closure. As Shahidul explains, “The exhibition attracted so much interest as it was the only show that dealt with extrajudicial killings. Much of the work produced by artists in Bangladesh is apolitical. As a result, this particular show galvanised public opinion.” Unfortunately for Shahidul though, Commander Sohail read a report in a Bangla newspaper and quoted its contents to him over the phone on the day the exhibition was due to open. “It was an exchange of information,” said Commander Sohail, who added that he did not alert any authority after he spoke to Shahidul. RAB was not involved in the closure of the exhibition,” he stated. Shahidul’s message resonates with Nabila Afta, 23, an architect from Lalmatia. After visiting the exhibition she said, “This exhibition was a bold step. Even though RAB was established for a very good cause, at the end of the day it has turned out badly for many.” Nabila’s comments are in stark contrast to the views of Commander Sohail, who said, “The public is not terrified of us – it is the terrorists they fear. If you go through the newspapers and TV channels you will see the public’s reaction. In most of the cases, people are very, very, very happy because a violent terrorist has been killed.” Lieutenant Colonel Ziaul Ahsan feels similarly, saying, “Our main strength and achievement is having the love and confidence of the people. They believe that if RAB is deployed somewhere, there will not be a problem with law or discipline.” Lieutenant Colonel Ziaul Ahsan acknowledged that this is his personal opinion, as RAB does not conduct public perception surveys. Shahidul Alam has undoubtedly struck a cord within a population that is growing increasingly alarmed by the actions of RAB. Whether this translates into concrete change remains to be seen, particularly as RAB itself does not accept the criticism directed towards it. However it is undeniable that Crossfire has succeeded in taking the first difficult step towards highlighting the injustice suffered by so many.